Realme U1 vs Realme 2 Pro - Let's see which is better? The design of these two phones are same. Both have dew drop display, dual rear camera and fingerprint. Realme U1 has 13MP + 2MP rear camera but Realme 2 Pro has 16MP + 2MP. 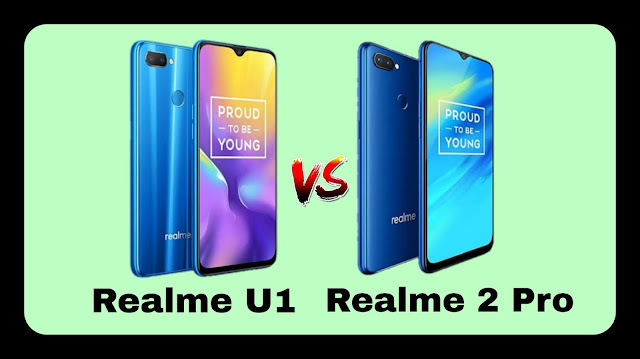 Selfie camera in Realme U1 has 25MP which is better in compare to Realme 2 Pro's 16MP selfie camera. Realme U1 is powered by MediaTek Helio P70 and Realme 2 Pro is powered by Snapdragon 660. Both of them runs on Android Oreo based ColorOS 5.2 and has 3,500mAh battery.